Samsung executive confirms that Galaxy Gear watch will be unveiled in Germany ahead of the IFA trade show. In speaking with The Korea Times today, a Samsung executive officially confirmed the upcoming Galaxy Gear smartwatch, with a launch set for the 4th of next month. Rumors of the device began swirling over the past couple weeks, along with a list of possible specifications, and we now have word from Samsung themselves. Lee Young-hee, Samsung's executive VP of mobile business, spoke with the publication and confirmed that the Galaxy Gear will be introduced in Berlin, a few days ahead of the IFA consumer trade show. 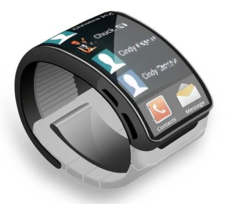 The smartwatch will apparently be based upon Android OS and will feature a "non-flexible" display, though the possibility of future flexible displays was left open. High hopes also appear set for the watch, with Young-hee claiming that "the Gear will add meaningful momentum to the mobile industry". In the same interview, Young-hee confirmed that the Galaxy Note III will also be making its way to Berlin, while she also shot down rumors of any Samsung interest in BlackBerry. Unfortunately, there wasn't mention of any other specifications for either of the devices, and we'll have to wait for the official announcement for more details.